He Xiangning Art Museum has always been concerned with the condition of young artists’ practice. 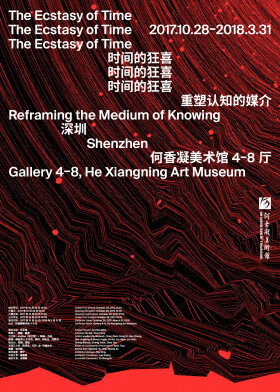 It is with great honor that we invite Guangzhou Academy of Art professor Hu Bin and independent curator Yuan Fuca to co-curate an exhibition titled “The Ecstasy of Time: Reframing the Medium of Knowing.” The exhibition features eleven individuals and collectives of young Chinese artists and commisions a performance installation “Prosecuting Sweat, Neon Dreams” in accordance with the theme. The works presented in this exhibition respond to different aspects of the complex relationship between “technology and art.” Using the context of postmodern language on the questions of technology and representation, Fredric Jameson once proposed that art today is re-productive art, while at the same time suggesting that the representation machines of late capitalism presents a challenge to our aesthetics. How is the world recreated by technology? How does this recreated world reconstruct our methods of viewing and thinking? Correspondingly, when the judgement criteria of modernism are no longer applicable to today’s media environment, how does one read the fragmented information contained in the works in light of the smooth content of the interface of production? In reality, with the gradual reduction of life itself to a commercialized image of imitation and replication, the elimination of the historic significance of incidents, as well as the reality of the audience’s pursuit of the pleasure of pure language, how can we reflect on the changes rising from the transformation of science and technology? Here, the reintroduction of the concept of time possesses a certain political necessity. Correspondingly, the material and sense forms of time receive interests in this exhibition. Within time, man is no longer the starting point for the news, but has become at various times the recipient, indicator, code, and medium supporting the news, and sometimes the news itself. This view of time redefines human plasticity—a sort of mechanism for establishing communication and discernment, a moment in time that includes the past, present and future, much like the concept of “ecstasy” described by Martin Heidegger, which is therefore a material manifestation of the “authentic present.” In this everaccelerating space-time relationship that promotes globalization, how do we understand the resistance of the form of time? Considering especially the speed of society above all else in China’s postmodern reality, how do we think deeply about the problems created by technology to establish individual judgment and resistance? We hope for “The Ecstasy of Time” to serve as a critical starting point.